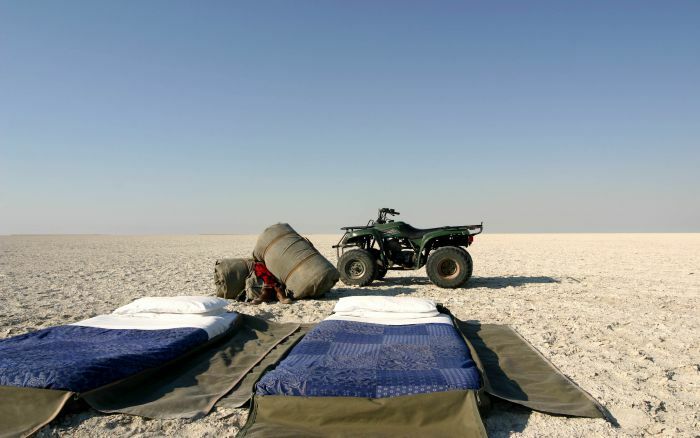 Set among a grove of towering baobab trees bordering the Makgadikgadi Pans, Planet Boabab offers excellent value accommodation and facilities, and opportunities to explore the pans and meet meerkats. Planet Baobab is in a remote setting on the Maun-Francistown road, among a grove of ancient baobab trees. 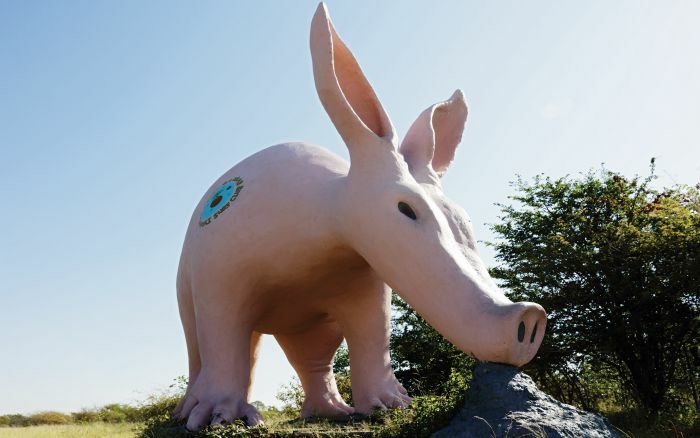 The lodge’s quirky style is evident as you approach with the giant aardvark statue denoting the site, and continues in the design of the swimming pool and restaurant. 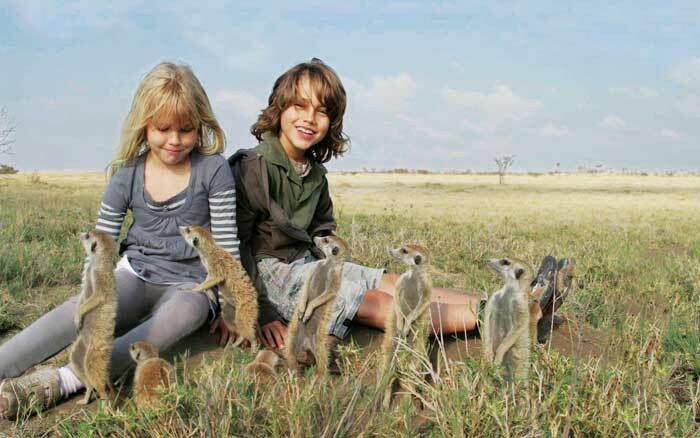 During your stay you can venture into the pans and spend a night sleeping beneath the stars, visit a nearby Batswana village, walk through a baobab forest and spend time with a group of habituated meerkats. In the green season (November – April) you can witness the spectacular zebra and wildebeest migration. 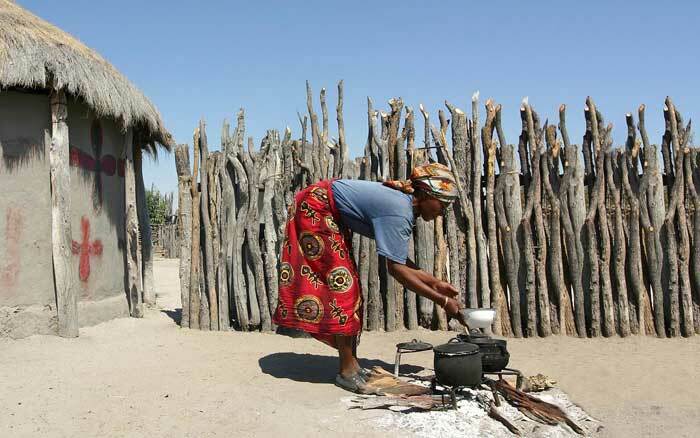 Accommodation is set out in the form of an African village with a scattering of Bakalanga huts and Baobab huts. All are en-suite and have colourful African-style décor. There are larger huts sleeping up to 4 people, ideal for families. Planet Baobab also has camping facilities. The swimming pool is the largest in the Kalahari, great for cooling swims. The restaurant serves pan-African cuisine, and there’s a bar where you can enjoy the company of fellow guests. Despite the remoteness of the location there is mobile phone coverage, and Wi-Fi internet access is available for a small fee. Children of all ages are welcome. The larger Bakalanga huts can sleep up to 2 adults and 2 children. All huts are circular and built of mud with thatched roofs, have en-suite shower rooms with running water. The Bakalanga huts are larger and are furnished with African artwork and textiles. The Baobab huts are smaller and simpler in style.